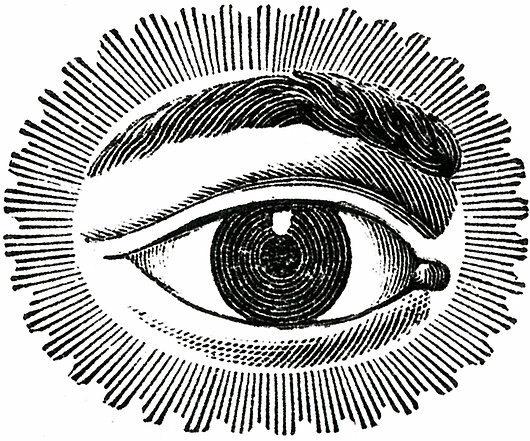 Is the right eye more connected to the ego? Does the right eye have a special connection to the ego? Remembering how I used to do eye patch experiments and how covering one of my eyes made me feel and how it seemed to be dependent on which eye was covered made me wonder today, "Is the right eye connected to the ego?" I got this assumption when I just out of the blue noticed that I was in a psychological/spiritual state that seemed egoless, and I was more tuned in to the sensory input of my left eye than I was of my right eye. Now I know that the eye muscles that make the eyes move are connected to the opposite hemispheres of the brain, and even the field of view of both eyes is hooked into the opposite hemispheres. And given that each of the hemispheres, which have unequal influence on both eyes, each could be said in some ways to have certain functions that they are more specialized for than the other hemisphere, I wondered if the ego was more influential over, or influenced by, one eye more than the other based on that eye's disproportionate control by the hemispheres of the brain. I did a preliminary search in Google (is the left brain connected to the ego) to see if this is talked about by anyone else. Your left brain has a bigger ego than your right brain "Psychologists have used an inventive combination of techniques to show that the left half of the brain has more self-esteem than the right half." Right Brain connected to Soul, Left Brain connected to Ego "A similar separation is seen in the brains of all vertebrate animals. The left brain (ego) is concerned with time and the right brain (soul) is concerned with eternity. When Jesus said, The kingdom of heaven is within, he meant it literally." Ego-Trip of the Left Brain "Dr. Taylor, a Harvard-educated, world-renowned expert on the human brain, woke up one morning having a stroke. By the end of the morning the left hemisphere of her brain was totally “offline,” as she puts it. She had no sense of personal identity; she couldn’t recognize her own mother, speak or understand speech, remember the most recent moment of her life, make and carry out a three-step plan, walk, or feed herself, among many other things we take for granted." Enjoy Peace with Right-Hemisphere Shift "The left brain is the seat of the ego, which when it gets too big, can do a lot of damage in the world with its endless optimism about how right it is." So there seems to be some acknowleged connection between the left hemisphere and the ego. It would seem to follow that since the muscles on the right side of the body are controlled by the left brain, then the right side of the body, and therefore the movement of the right eye, could be somehow connected to the ego.